When you say the words “I’m going to go to a Bosnian deli/grocery/restaurant”, unless you’re of Slavic heritage, you might get a quizzical look or comments like “We have one of those around here?”. However, my wife is more than used to my non-typical food adventures, and may even find them endearing. Skela Bosnian Deli has been operating well off the radar in a small commercial building on Merivale Road since the mid-2000s. My sister and her brood live not too far away, so I’ve passed Skela several times on the bus, and it piqued my curiosity. Growing up in a small town in Nova Scotia, where my half-Chinese-ness made me one of the few culturally diverse people in a land of MacLeods and McDonalds, I’ve grown to have a strong appreciation for other cultures and their foods. The front of the establishment is a typical small grocery store with some shelves, racks and coolers with a variety of primarily Eastern European goods. There’s also a deli counter, of course, with a lot of meat and some cheeses. I can’t speak to its contents or their quality (yet), as my target on this trip was the tiny restaurant area in the back. 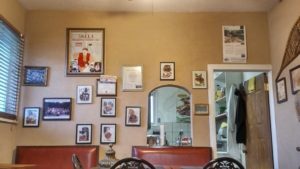 Seating a mere dozen at a handful of tables, with the wall covered in art and relics from the old country, and an open window to the kitchen, the space feels more like a family kitchen than a restaurant. Adding to that vibe were the several customers eating and talking to the kitchen staff in their native tongue. They obviously knew one another, and I almost felt like I was intruding. My hunger easily helped me get over this feeling, and I perused the small menu on a whiteboard hanging on the wall. 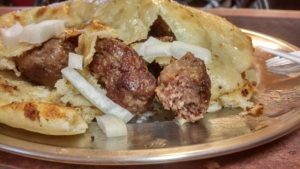 Having done a little research before visiting, and a little on-the-spot Googling, I went for a large order of the cevapi (se-vap-ee), which is a dish of small Bosnian kebabs in a flatbread, and a side of ajvar (eye-var), a red bell pepper sauce. Noticing the cues from the other patrons, you must get up and go to the cooler to get your own drink, although I stuck with the cevapi and ajvar. It was a bit of a wait as the place was effectively at full capacity, and orders for the other patrons came out bit by bit before my own, but I soon had my plate of new-to-me food. Unfortunately, the ajvar wasn’t there, and I was not checked on at all after this, so I can’t speak to that item. But I can go on and on about the hefty plate of cevapi. 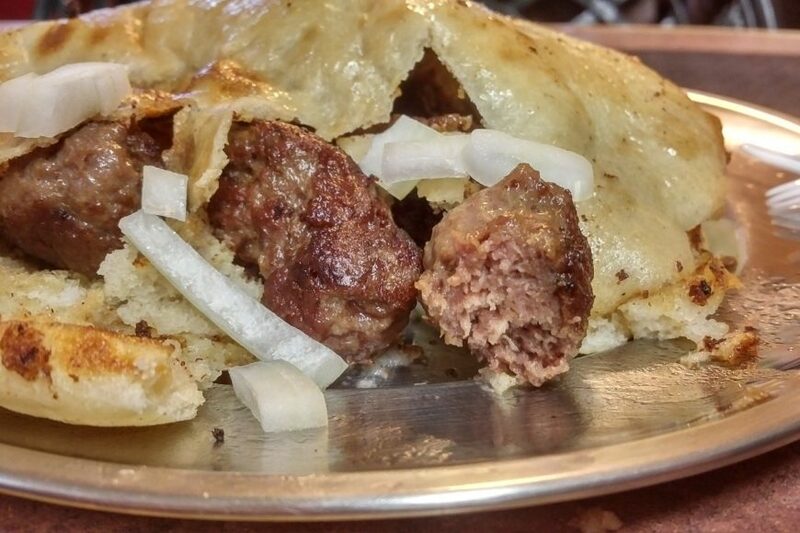 The large flatbread, lepinja (lay-pin-yah), was filled with the 2-3” long pieces of cevapi, and there was a side of roughly chopped white onion. The lepinja had a nice bit of browning from the flattop, and from its sheen, may have been finished in the cevapi drippings. Be still, my heart. No, seriously, I may have had a mild cardiac event from this. I digress; the bread was supple and pleasantly chewy, and held up to the meat within it. 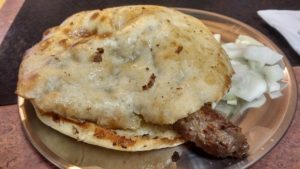 The cevapi had a fantastic crust from the grilling; they tasted like a blend of lamb and beef, and were mildly seasoned – certainly not spicy at all – with the only bite coming from the onion. The texture of the meat was tender, with a bit of sponginess like many kebab-esque meats, but not to an off-putting degree. With ten of these tubes of deliciousness and the bread, it was a very, very filling meal, and at just $11, a relative steal. Skela is a textbook example of a niche, family run shop with great products, filling a gap in the market and enriching the cultural landscape of their locale, but also has iffy service. I’d come back without hesitation though, either for the prepared foods or to try some of the deli meats, but I will be a bit more attentive to my ajvar orders next time around.